This U.S. Mint numismatic sales report covers the week ending June 4, 2017. 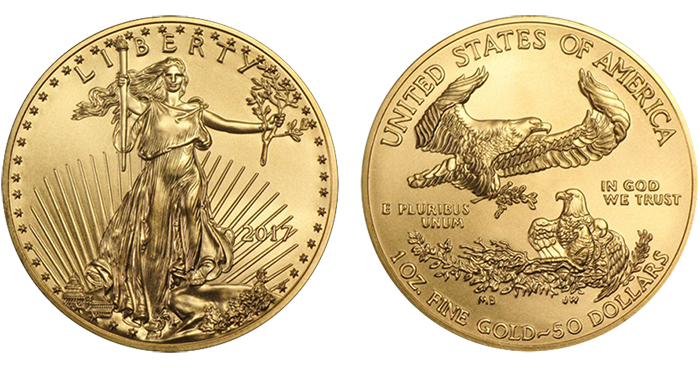 The week saw the release of the first new Mint product since May 17: the 2017 American Eagle 1-ounce gold Uncirculated coin (17EH), which went on sale at noon on June 1. The coin’s weak sales figure of 1,881 made it the Mint’s fourth-best seller for the period (by way of comparison, the 2016 Uncirculated AGE sold 2,968 units during its first week on report). Annual sets dated 2017 secured the top-selling places on the Mint’s list this past week. Number 1 was the 2017 U.S. Mint Proof Set (17RG), with 8,169 units sold, followed by the 2017 U.S. Mint Uncirculated Set (17RJ), with 4,108 units sold. The third-ranking item was the 2017 American Eagle silver 1-ounce Proof coin (17EA), with 2,824 sold. Another ASE product, the 2016 Uncirculated coin (16EG), rounded out the top five with 1,617 sold. Only one catalog item took a significant downward adjustment during the period: the total figure for the 2017 Frederick Douglass National Historic Site 5-ounce Uncirculated coin was reduced by 979 units, for a June 4 total of 13,929 sold. No items have been newly marked “unavailable” or “sold out during this period, and none were moved off the sales report. Next week’s report will include two new releases. The category of America the Beautiful–Ozark National Scenic Riverways quarter bags and rolls was made available June 5, with six product codes; and the 2017 U.S. Mint Silver Proof Set (17RH) will be released tomorrow (June 7) at noon. The third edition of MEGA RED, with 1,504 pages, 8,200 listings, 7,000 images, 15,400 auction records, and more, is now shipping! Click this link to order. 17XB Am. Liberty silver medal (W) To be released June 14, 2017. 17EH One-ounce AGE Unc. 1,881 1,881 Released June 1, 2017. 17RH 2017 U.S. Mint Silver PF Set Released June 7, 2017; not yet on report. 17ABG 100 Coin Bag (P) Released June 5, 2017; not yet on report. 17ABH 100 Coin Bag (D) Released June 5, 2017; not yet on report. 17ABJ 100 Coin Bag (S) Released June 5, 2017; not yet on report. 17ARG Two-Roll Set (80 Coin) (P&D) Released June 5, 2017; not yet on report. 17ARH Single-Roll Set (40 Coin) (S) Released June 5, 2017; not yet on report. 17ARJ Three-Roll Set (120 Coin) (P&D&S) Released June 5, 2017; not yet on report.